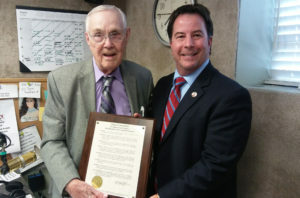 The Smithfield Town Council and Mayor Andy Moore recognized WTSB’s Carl Lamm on Monday. Carl is retiring this Friday, March 29th ending a 72 year career in radio. Monday afternoon, Mayor Moore appeared live on WTSB Radio and presented Carl with a Proclamation honoring his distinguished career and retirement. Moore read the Proclamation live on the air. “The Smithfield Town Council, by this recognition, wishes to express its sincere appreciation to Carl Lamm for meritorious service, loyalty and dedication to the Town of Smithfield and its citizens,” the Proclamation stated. Carl’s final broadcast on WTSB Radio will be this Friday from 1:00pm – 4:00pm. WTSB will sign off the air on Sunday, March 31st at the end of the broadcast day. While WTSB will being going silent until a new owner is found, JoCoReport.com will continue to operate.